Absolute proof aliens exist information. This has got to be the best proof anyone could ask for. A flying disc was seen by pilots, crew members, and a bunch of other people at the Chicago O'Hare Airport in November, 2006. The whole story was shown on CNN January 6, 2007. This to me is undeniable proof that aliens exist. I think we just might be on the verge of Actual Contact with these extra terrestrials. View the video here. Right click over the link and select open in a new window. Apollo 11 UFO Video-A must See! Buzz Aldrin describes the bright object him and his crew saw on the mission. More definite proof aliens exist. New Article which FINALLY proves without a doubt that life exists elsewhere than on our planet. Read this! Until there is a UFO or intelligent alien life form filmed and broadcast on mainstream TV, it is unlikely that the general population will believe in all the sporadic UFO sightings that people tell us of each year. Confirmation from the Government or Nasa that Aliens really do exist seems to be the proof that we are all waiting for. The fact that it hasn't come yet is what leads many to believe that UFO's don't exist. Yet there is a LOT of proof that they do. I put more emphasis on historical proof then current ufo pictures and videos. The overwhelming evidence of UFO's from past civilizations on Earth is the most convincing proof I can think of. Giant stone edifices like the Great Pyramid, or the Nazca Lines in Peru are some of the best proof. They still stand today while modern day UFO sightings only last a few minutes. There is no possible way despite what you may have seen on TV that these ancient cultures could have build such amazing monuments such as Machu Pichu, the Great Pyramid, The Nazca Lines or even Stonehenge. What most likely happened is that after doing many great things on Earth, these aliens took their stuff and left Earth. Leaving behind many proofs that they were once here. Whether we choose to see the truth or not is up to us. 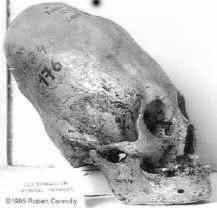 We have found alien looking skulls, ancient monuments that we would have trouble building today, metals that don't originate on Earth, (in China these were found) they were completely spherical and well fabricated. There are also many VERY believable UFO case files that are not fakable. Yet as I have said before until Nasa and the Government say OUT LOUD, THEY EXIST, we as a whole people will not totally believe in ufo's. However if you are smart and you can see past the ludicrous explanations of ancient wonders, then you will believe in UFO's without that Nasa confirmation. They may just be hiding it from us, I don't want however to go into conspiracy theories. I don't have any proof of that. The following picture and paragraph are in my mind absolute proof that advanced beings were here on Earth in Ancient History. To think that we are the only planet amongs the many billions of other planets in the universe with intelligent life on it is kind of arrogant and misguided. What makes us so special? Life can form in the most inhospitable of places like in the bottom of the oceans where there is no light, and where temperatures are very unfriendly. There is no doubt intelligent life out there somewhere. Someday we will surely meet some of them. In this picture that I took in the Cairo Museum you can see that incredible precision with which this gigantic stone pyramid was built. To say that it is precise is an understatement. When I was standing in front of this stone pyramid I said to myself how in the hell could a primitive people 5000 years ago create this. Let me tell you it is absolutely impossible. Unless they had advanced technology... Which they did without a doubt. This stone alone surely weighs 1-4 tons. To move this stone today it requires a large crane. This is a picture I took in Egypt, notice the heads of the 2 figures in the picture. The abdomens of the 2 people or aliens is also different. 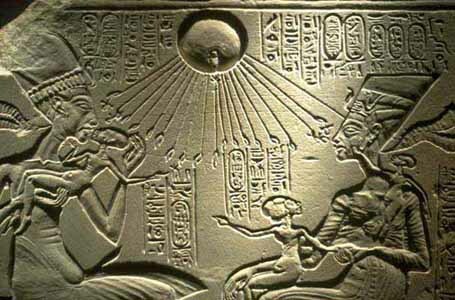 It is stuck out a bit, many of the pictures in Egypt portray what I am positive are aliens and many of them have larger stomachs than a normal healthy human would have, they are not a cause of obesity. They also often have larger than normal thighs in association with their bodies, in comparison with normal humans. This picture shows 2 young aliens as their thighs are proportionate. On the next page you will see that they have larger thighs and also longer and more slender fingers. 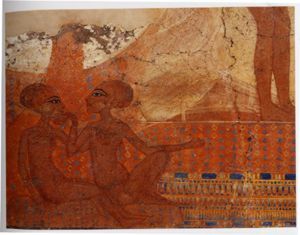 This feature (long fingers) is shown often in Ancient Egypt paintings. 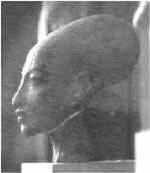 This is a photo of Nefertiti the Goddess who lived in Ancient Egypt, notice this Goddess's head. Her skull is extremely elongated, this would mean her brain would be much larger than a normal human's. Therefore making her extremely intelligent. This is actually a statue of her, it is in a museum in Egypt currently. Several pictures in Ancient Egypt portray some of the Gods or Goddesses with extremely large elongated heads. Is this some coincidence, why would the Ancient Egyptians make such large heads in their photos, carvings, and statues, there had to be a motivation of some kind apart from an artistic one, and in my opinion there is nothing artistically appealing about a large elongated head, so why did they do it? Read on to find out why! This is a photo of a skull found in Peru, notice the elongated back of the skull.This is one of the many Deformed skulls photographed in the Museo Regional de Ica. This is clearly not a human skull, we have been fed a variety of unlogical explanations as to why this skull has this formation. Several like it were found in Peru with small variations. Many artifacts that were clearly of Egyptian origin were also found in Peru dating back to the time of the Ancient Egyptians. However these two cultures and countries were not supposed to have had contact back then being so far from each other. Many odd things are found in Peru, the Nazca lines, a set of animal and geometrical lines engraved onto the ground which extend for miles. Engraving these lines would require a view from above to do them correctly, yet they were not supposed to have aircraft back then. So how did they do it?? This skull gives us a good idea. If they had brains big enough to fit into these skulls they could obviously find ways to fly in aircraft or spacecraft no doubt. 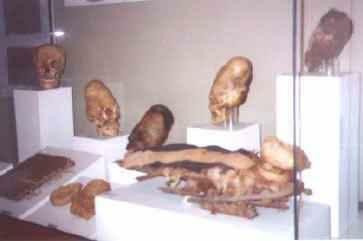 A photo of other skulls found in Peru are below. The next picture is an engraving in Ancient Egypt, notice the hats worn by the two adults, could they be covering their large heads and skulls? Notice the 2 babies, one on the left has an elongated skull, so do the 2 on the right. Could all these facts be just coincidences? Of course not? We are not all that gullible to keep accepting all these foolish arguments for all these obvious alien things we see around the world. Egypt, Peru, Mexico, Easter Island, we have been fed a bunch of baloney about the origins of all these incredible works and their builders. 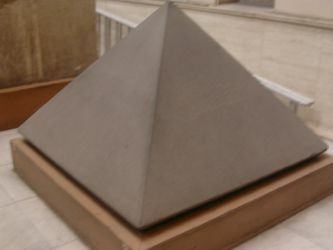 We are told in schools that the great pyramid of Egypt took 40 years to build and it's purpose was to bury a pharoah. Come on now, are we that gullible and were the Egyptians that gullible? Of course not, who would spend 40 years of hard labor building a pyramid just to stuff a dead body in it after 40 years of hard work. That hardly sounds logical for such an obviously advanced culture as the Ancient Egyptians. They invented their own language for god sakes, are we to think they were dumb enough to spend 40 years sweating their guts out for only burying 1 body. That is the stupidest thing we have been fed by Egyptologists to date. In Mexico the group of pyramids including the pyramid of the sun are known by people in Mexico by legend as "Place where the gods touch the earth." In all evidence this probably means where the aliens landed. Where they touched the Earth... Think about it, the pyramids are large stone monuments in Mexico with steps going down the sides. What better purpose for the steps than to allow the aliens to climb down the pyramids to the ground. That is the most logical reason for their construction. And to think that primitive people could build something so incredible is well not likely in all logic. Here are all the skulls found that are elongated at the back. All these skulls are catalogued and genuine. They are all together in a museum. Reproduction in whole or in part in any form or medium without express written permission of Alien-ufo-pictures.com is prohibited. Copyright © 2016 Alien-ufo-pictures.com All rights reserved.